Don’t you just love Dr. Seuss? I know I do. Oh yea — my kids do too! March 2nd is the birthday of the famous writer and many celebrate the day. I made some little treats for my kids for a little celebration. I am in love with this push pop concept and I know y’all will love them too. 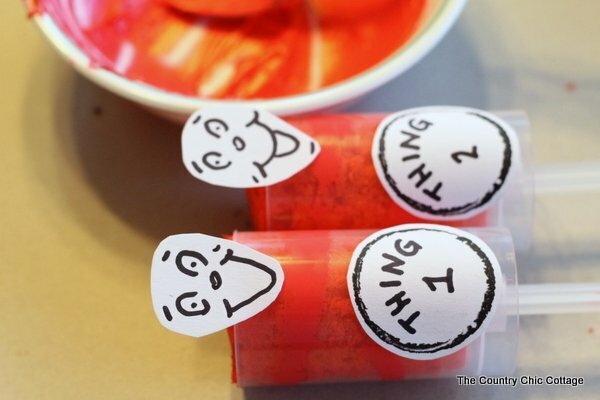 My Dr. Seuss push pops are sure to put a smile on your kid’s face. Aren’t they almost too cute to eat? Well almost. My push pop containers came from Consumer Crafts . 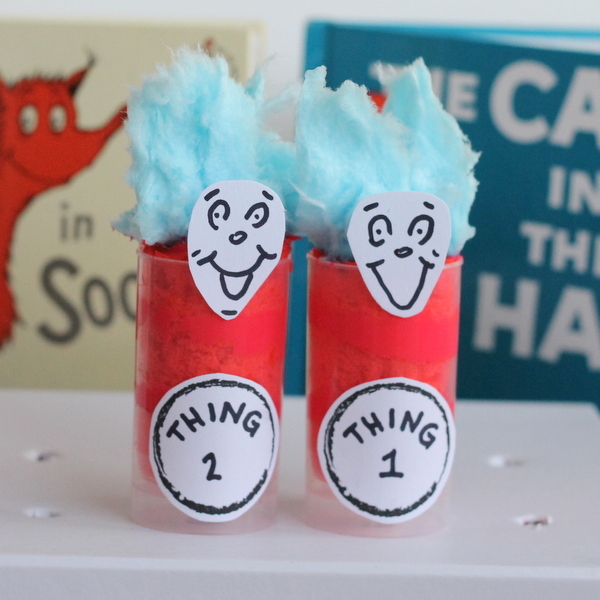 For the “Thing 1” and “Thing 2”, I used a ring from my PSA Essentials stamps and free handed the lettering. I actually looked up images of Thing 1 and 2 online and free handed the faces. I just used a sharpie and white cardstock. Then bake a cake straight out of a box mix but color it red. 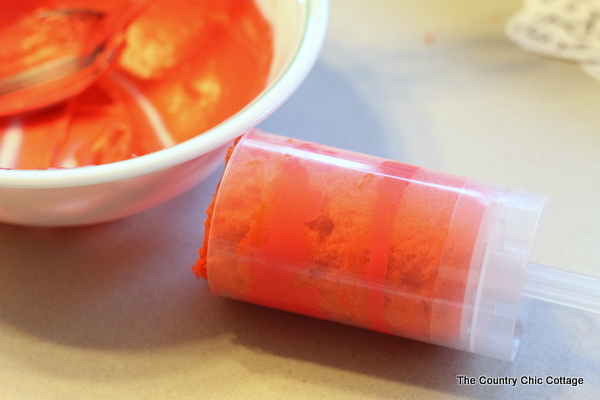 If you have not already tried them, gel food coloring will give you a much richer color. I actually baked my cake in 3 layers so each layer would be thinner. 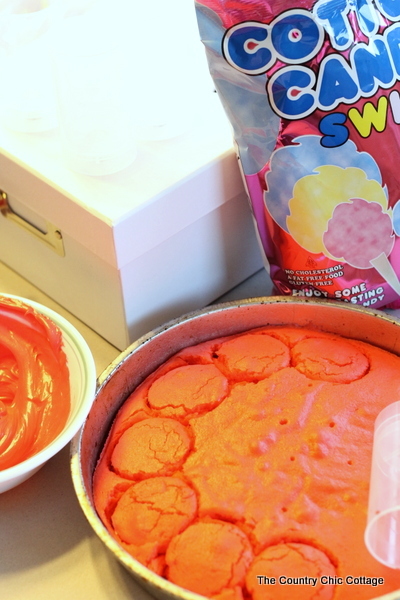 I used the same gel coloring for my icing. 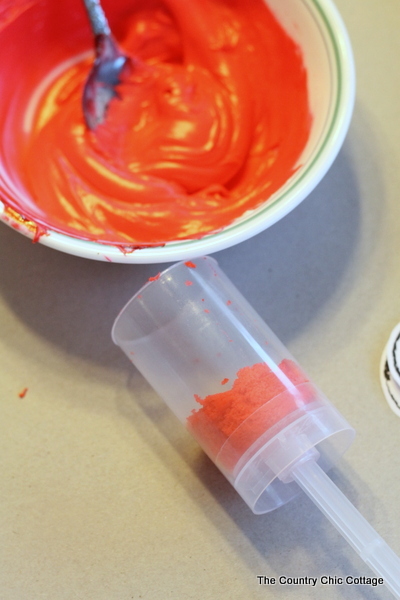 Use the push pop container itself to cut your rounds of cake. Start with a little cake in the bottom of your push pop container. Then add in a layer of icing. Repeat until you reach the top of the push pop container. For me, it was 3 layers of cake and 2 layers of icing. 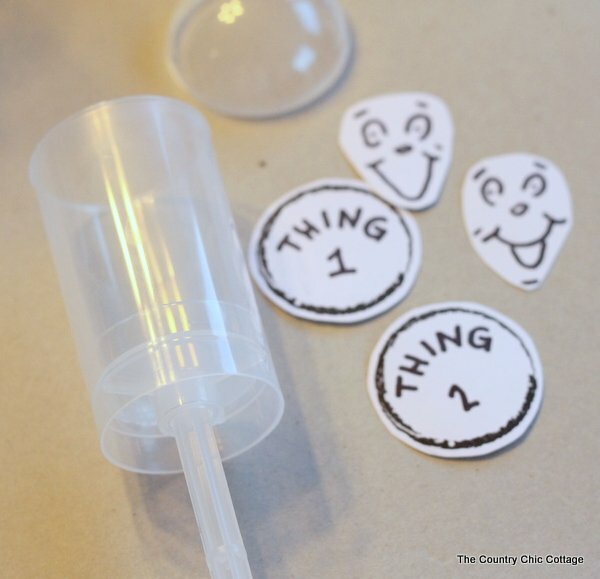 Add your cardstock decorations on with a few glue dots. Then use a little icing to add on some blue cotton candy hair. They are done and ready to eat! If you can even eat something this adorable. If you are taking these to a school for a party, add your cotton candy hair after you get there. Cotton candy does not do well when exposed to the moisture of the cake so add it just before serving. We have a huge collection of Dr. Seuss books around our home. I think Dr. Seuss is someone who is loved by kids and adults alike. This makes celebrating his birthday even more fun. 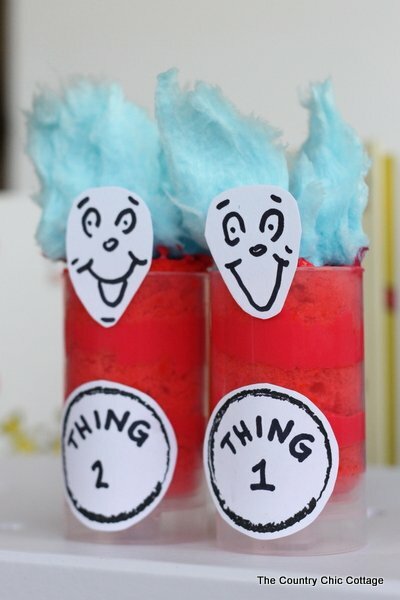 Invite Thing 1 and Thing 2 to your house for supper on March 2nd or any day of the week. 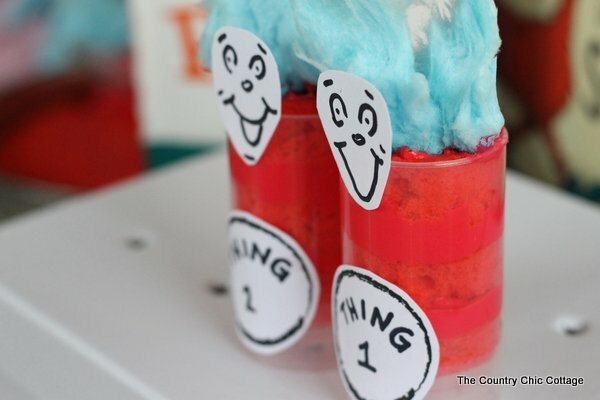 These push pop cupcakes are easy enough for everyday but special enough to be a treat for your celebration of Dr. Seuss’s birthday. 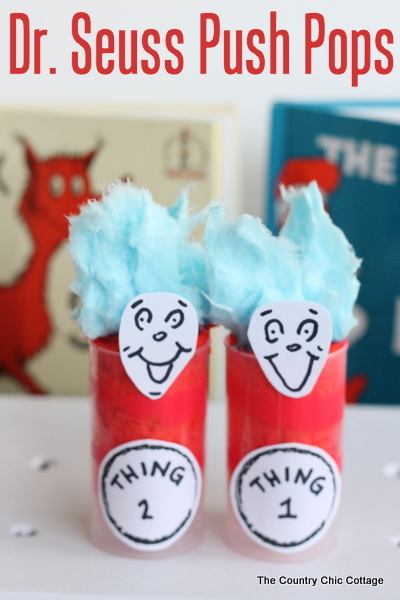 Want even more ways to celebrate all things Seuss? 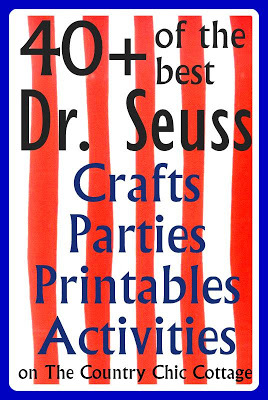 Head on over for over 40 ways to celebrate the birthday of Dr. Seuss. And check out my friends and their Dr. Seuss projects! cute! great idea. I love the cotton candy. Oh my– love that wild “hair” — haha! ACK! The cuteness just kills me! Definitely going to do this for the kiddos. This is the best thing I’ve seen so creative. 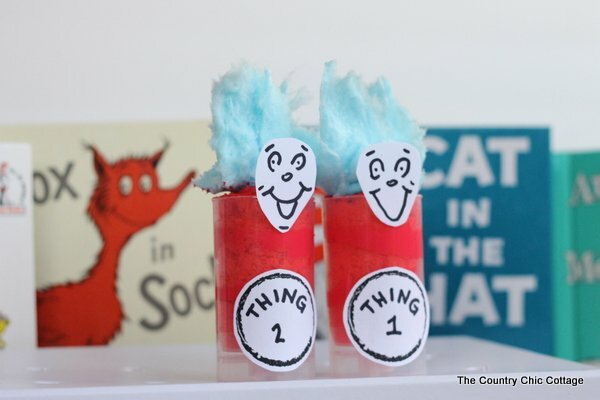 I invite you to share this tasty treat on my Countdown to Dr. Seuss’s Birthday Linky. I found your blog by chance, while peeking others and I decided to check it out! I’m glad I did it, because I am really delighted with yours. It’s beautiful, well structured, interesting… and it has completely got me hooked. I think we’re going to get along just fine! 😉 I’d like to invite you to meet my space as well and I hope you’ll have as much fun as I am having in yours!